Cardiac Horsepower | THERMO Spoken Here! While your body is at rest your heart beats somne 70 times a minute. Its rhythmic contractions causes about 5 liters of blood to circulate to your toes, back and elsewhere. Your heart pumps your blood twice. 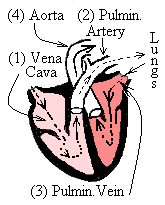 The blood flow returning to the heart enters the vena cava (1) at low velocity and an average pressure of 10 millimeters of mercury. Next the heart pushes blood into your lungs. That flow exits the heart by the pulmonary artery (2) ~ 30mm Hg. Returning from the lungs through the pulmonary vein (3) the pressure of the oxygenated blood flow is about 10mm Hg. Finally, the heatrt routes the blood through the aorta (100 mm Hg) to flow back (4) to your toes and other important (at rest) places. The heart of an engineer is just another pump! Right? Use the data, make some assumptions. Estimate the horsepower of a human heart at rest. ♦ The human heart is a two stage, pulsating, transient acting, biological device. The volume of the heart decreases with each beat (as whoever designs artificial hearts will tell you). Note: Data, taken from typical sources, have inconsistent and "unpreferred" units. Principles of calculation are correct: problems with units are "ironed to conformity" in the last equation yielding answers. In setting up the energy equation, the change of energy of the blood while in the heart is zero (dE/dt = 0). We write "energy with mass flow" in two pieces which are energy changes of the "first stage" and the "second stage" of the heart. The potential and kinetic energies differences, "entering (in) minus leaving (out)" are assumed very small. The mass rates are equal through each stage. The enthalpies contain internal energies of the blood. We assume the entering and leaving internal energies are equal such that what remains are p/ρ terms. Terms are collected. Check to confirm this result is correct. Care has been taken to keep the density of mercury and blood properly involved. A second check of the equation-stream shows the resulting minus sign to be correct. Also, the physics is correct; The energy transfer (work of the heart) is energy that passes from the heart muscles to become energy of the flowing blood.